The direct-to-consumer marketplace for high-end and vintage furniture, lighting and art now owns one of the largest marketing platforms for interior designers and to-the-trade manufacturers. Here's what that means for interior designers moving forward. When thinking of the direct-to-consumer model, companies like Casper and Warby Parker likely come to mind. If you've been following our coverage here, then you might also think of Campaign Living, Burrow and Boundless. What about Chairish? If you haven't already thought of Chairish in this way, you should be watching it closely now. Last month, the direct-to-consumer marketplace for buyers and sellers of high-end and vintage furniture, lighting, rugs and decor announced it had acquired Derring Hall, the online marketing platform that connects interior designers and to-the-trade manufacturers and allows consumers to search for design professionals. So what does this mean for the interior design sector of the home design industry? Here's what designers need to know and think about for the future. If you visit Chairish's homepage now, you can access Derring Hall from the top navigation bar, along with Decaso. All three sites now have a more uniform look. In general, Chairish and Derring Hall have more or less merged. Derring Hall isn't going away (for now), and the company's co-founder, Peter Sallick, will join Chairish's executive team. Together, all three sites will have 2.5 million monthly visitors and more than 250,000 verified design professionals. According to an interview with Chairish co-founders, Anna and Gregg Brockway, the acquisition will enable data sharing between the two companies. 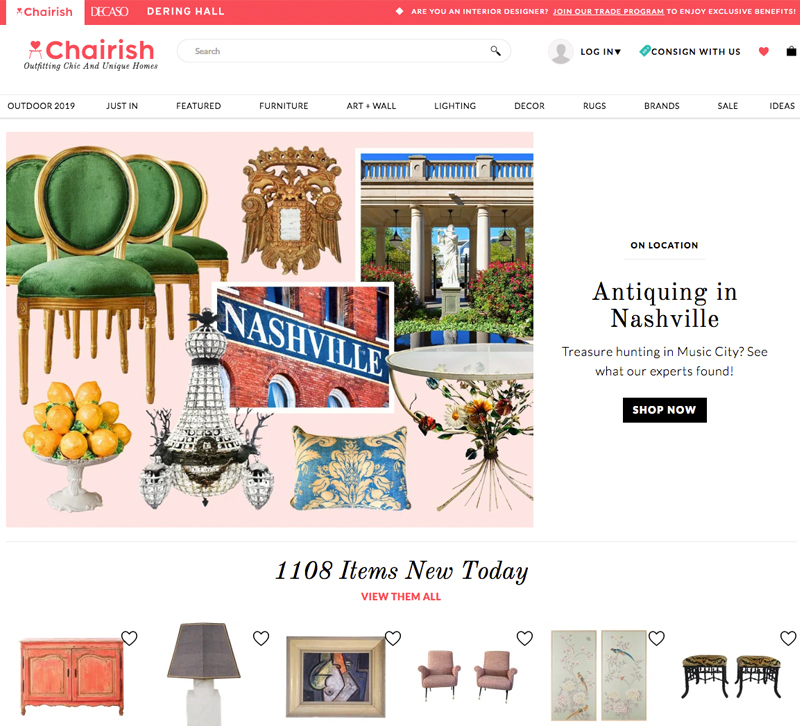 As an e-commerce platform, Chairish has access to tons of customer data on what's selling on the site and app, and while Derring Hall may not sell anything, it's not hard for developers to see which companies and designers are interacting. As for the buyers and sellers on Chairish? Retailers will continue to sell, and both consumers and designers will be able to purchase all types of products. The disruptions and changes surrounding interior designers is something this publication has been following closely for the last few years. From e-design to the shopping tastes and preferences of consumers, we've seen new trends emerge as more consumers get comfortable buying big-ticket items online. As we recently reported in our January 2019 issue, interior designers were largely shielded from competition online because so many manufacturers only sold directly to designers. That all changed when the recession hit. Fewer consumers could afford designers, and therefore, selling only to designers became less profitable. Some manufacturers started selling to retailers and some directly to consumers online. Then as the economy got better, the direct-to-consumer e-commerce model took shape. The direct-to-consumer model started online as a way to deliver goods to consumers at cheaper-than-traditional-retail prices. Consumers couldn't touch or sit on the product (at first, anyway), but with good return policies and quick shipping, they felt it was all worth the risk. Many of these companies manufacturer in the U.S., which appeals to consumers looking to shop local, and local production means faster shipping. So where does all of this leave designers? If Chairish enables to-the-trade companies to sell products on its website and app (and there's good reason to think this will happen, says Unity Marketing's Pam Danziger), design-loving consumers with the ability to pay for high-end products will be able to bypass the designer entirely and go straight to the manufacturer. Of course, designers too can buy from Chairish (and many do), but they won't have the exclusive access they've previously enjoyed. To be clear, this is not the end of the interior designer profession, but it further points to the shift we reported in our January issue: that the types of clients for designers are slowly shifting into two categories. On the one hand, there's the luxury client who can afford a designer and wants to have the home designed while the client focuses attention elsewhere. On the other hand, there's the client who likes tackling DIY projects, researching products and reading about design. This client doesn't need a designer to purchase products — and may not be able to afford high-end furnishings — but they do want a designer to help them put a room together and answer all their questions. Business consultant Julia Molloy calls this a design concierge service, and it could represent the new future of interior design, one in which designers let clients handle the purchasing. For some designers, this could actually be a relief. As designers struggle with clients who shop around them, providing just design services would relieve them of that struggle while still getting them paid for their design expertise. Suffice to say, the interior design sector will continue to see big changes as consumer tastes and shopping habits change. Designers, what do you think about Chairish's big acquire? Share with us in the comments!